Singing, and music in general engender many emotions, as discussed in this post. There are many positive emotions that arise from singing, as well as the occasional one. One aspect of positive emotion found particularly in choral singing, is trust. Trust is a powerful emotion because it takes time and effort to build, but can be broken in an instant. The director of an ensemble is the leader in many ways. From selecting the music we sing, to facilitating our learning of a new piece, to ensuring that all the disparate parts of the choir come together, to creating artistic, musical moments in live performances, the director is responsible for so many aspects of our choral experience. This would be an impossible job without the trust of the choristers under their charge. Singing with others means trusting them to do their part. Choir is about disparate parts making up a whole, and in order to do that, choristers have to subsume their ego, and blend into a sound larger, and grander than they can make by themselves. This requires a delicate balance between doing your best for the group, and supporting other choristers in doing their best for the group. This can be the most difficult aspect of singing, because while we are singing, we don’t actually hear the piece the way the audience does. 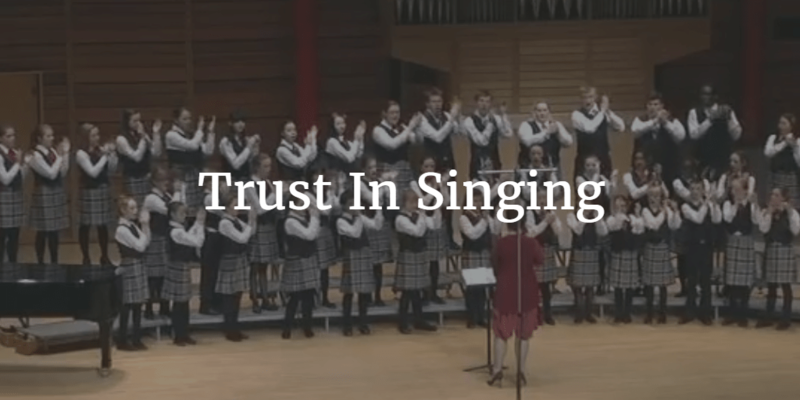 In a performance, we must trust our training, trust the director, trust the other choristers, but most of all, we must trust the music, and the emotion we feel during a performance, to help inspire our singing, and drive us towards our best singing selves. How else is trust important in singing? Tell us in the comments below!